Close to an year wait for Apple iPad in India is over. Now everyone can buy a genuine iPad with manufacturers’ warranty from dozens of retail outlets set up by Future Bazar’s eZone and Reliance iStore. This puts an end to the grey market that was importing iPads through illegal channels, selling them at staggering high prices and with no warranty. The iPad page on eZone’s website has price details of various models and they range from Rs.27,900/- to Rs.44,000/-. Grand Terrace, Old no. 94, new door no. 162, Luz Church Road, Mylapore, Chennai – . Tamil Nadu. Phone : 24987867/68. Shop No-S-23, 2nd Floor, Oberoi Mall Off Western Express Highway , Goregaon(E) , Mumbai – 400063, Phone: 28410011/40214771. Hailko Mall, Level 2, Central Avenue, Hiranandani Garden, Powai, Mumbai, 400076. Phone: 25717355/56. C wing,SOBO Central, Next to Tardoe AC Market, Pandit Madan Mohan Malviya Road, Mumbai – 400034. Phone : 022-30089344.
pasadena’ (Ground floor),18/1. (old number 125/a),10th main,Ashoka pillar road,Jaynagar 1st block,Bangalore – 560 011. Phone : 26577527. Ground/Lower Ground Floor, Plot # 26, Pusa Road, Adjacent to Karol Bagh Metro Station, Karol Bagh, New Delhi – 110005. Phone :28757040/41. 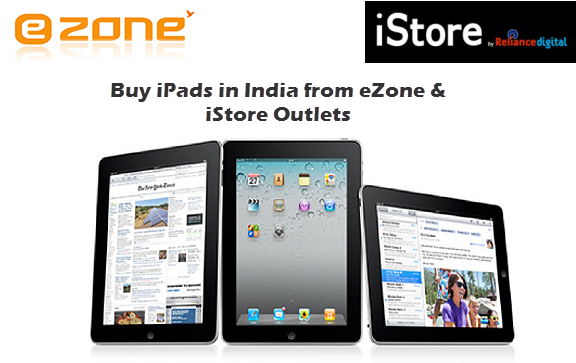 Reliance iStores are exclusive outlets for selling Apple products in India. All the models of iPad are available at Reliance iStore and the price details are not available on their websites. You may walk into any of the iStore close by your locality or call them to get the details. To locate the stores close by your locality please check store locator page on iStore Website. Do you know any other retail stores selling iPads in India? i want to break the jail code of i-pad2 version 4.3.3 (8J2) which i purchased from dubai. i want to come to your centre. what is the cost for jail-break and tell me the address of your centre at axxxxxx89@gmail.com or call me at : 9xxxxxx54. Do you have the Ipad2 i stock. IF not when will you get some? I need the 16 gig wifi model as soon as possible. if you are not from India, then you can skip reading this comment. Yesterday I dropped in to Reliance iStore to check availability of iPad 2. They are not available and the guys who work at the shop are very confident of getting it in another 20 days. They estimate it to be available by April mid. If we have to trust these guys then it’s going to be celebration time during mid of april.